People look forward to the summer months for many reasons, whether it be getting a break from school or the chance to see some of the biggest movies of the year. This particular summer, however, fans in the U.K. will get to experience a brand new Harry Potter story live on the London West End stage when Harry Potter and the Cursed Child opens for previews at the Palace Theatre in London on June 7, before its first official performance on July 30. While we await any further details about this long-awaited stage play, a new preview has surfaced that offers a behind-the-scenes look at the rehearsal process. The video, which was posted at the official Harry Potter and the Cursed Child Facebook, features author J.K. Rowling visiting the rehearsals, and while we do see a number of actors practicing some sort of maneuvers with their wands, it's difficult to figure out what exactly is happening. One brief snippet of footage shows several actors choreographing a scene that involves a number of trunks and suitcases. The video also features J.K. Rowling meeting with director John Tiffany and playwright Jack Thorne. Here's what she had to say during that meeting, where she emphasized keeping the secrets of this story under wraps. "One of the things that I have valued most about the Potter fandom is that as a community, they have really looked out for each other. People have each others' backs. It's a special thing. It's for that reason, more than any other, that I would like us - if we can - to keep our secrets. This will be such an incredible theatrical experience, that I'd love us to be able to surprise people and move people in the natural way that a story should surprise and move people." John Tiffany also talks about how the first preview audiences will help the director and writer get a better idea of what works and what doesn't, and that, essentially, every preview performance will be quite different than the last. Jack Thorne also reveals that aspects of the play that work well in rehearsal may not have the same impact on the stage. Since we still have several weeks until the first preview performance, we'll have to wait and see if any more of these sneak peek videos will be released. 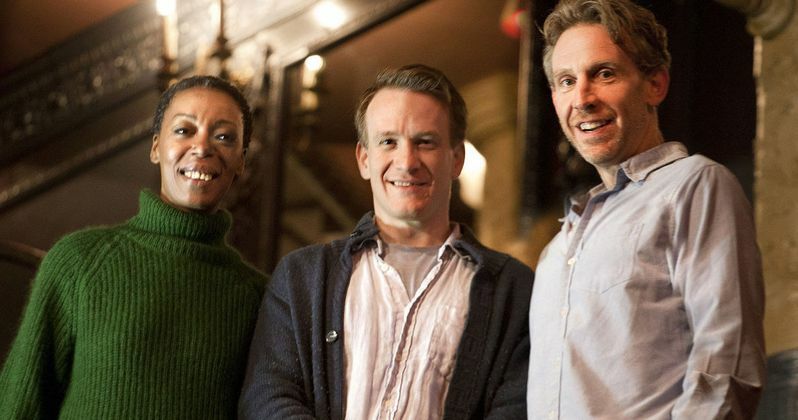 The stage play cast includes Jamie Parker as Harry Potter, Noma Dumezweni as Hermione Granger and Paul Thornley as Ron Weasley. The cast is rounded out by Nicola Alexis, Helen Aluko, Jeremy Ang Jones, Rosemary Annabella, Annabel Baldwin, Jack Bennett, Paul Bentall, Anthony Boyle, Zoe Brough, Sam Clemmett, Morag Cross, Cristina Fray, Rudi Goodman, Claudia Grant, James Howard, Christiana Hutchings, Lowri James, Chris Jarman, Martin Johnston, Bili Keogh, Chipo Kureya, James Le Lacheur, Helena Lymbery, Tom Mackley, Barry McCarthy, Sandy McDade, Andrew McDonald, Adam McNamara, Poppy Miller, Tom Milligan, Jack North, Alex Price, Stuart Ramsay, Nuno Silva, Cherrelle Skeete, Esther Smith, Nathaniel Smith, Dylan Standen and Joshua Wyatt. No character details have been given for any of these actors quite yet, but the cast list includes seven child actors who will alternate between roles. J.K. Rowling shot down rumors last month that a Harry Potter and the Cursed Child movie will be coming to the big screen. But fans will get to see a much different glimpse at this magical world in theaters later this year. Warner Bros. will release Fantastsic Beasts and Where to Find Them in theaters on November 18, which will be the first movie in a new trilogy. Check out this behind-the-scenes video from The Cursed Child, and stay tuned for more sneak peeks as we get closer to the play's debut this summer in London.